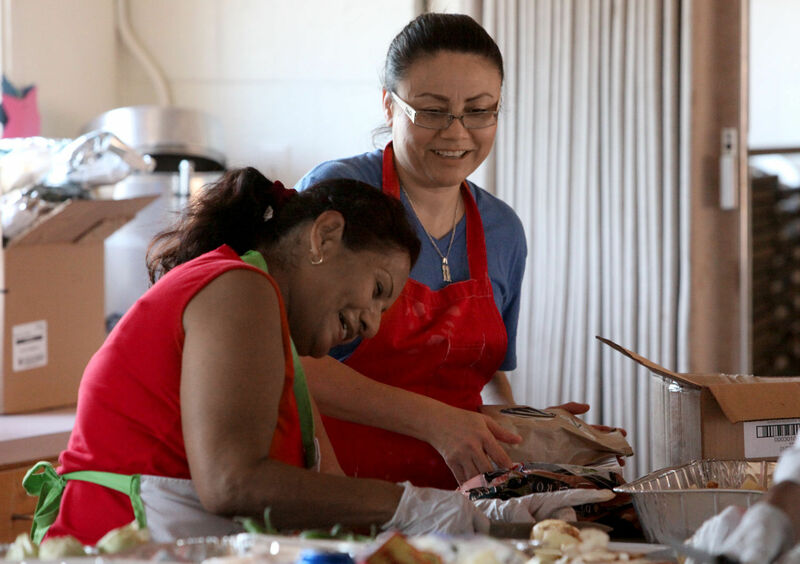 Josie Valenzuela, left, and Robles Loreto share a laugh as they prepare meals. Robles Loreto helps cook for homeless people who eat at the church twice weekly. Photo by A.E. Araiza/Arizona Daily Star. Rosa Robles Loreto used to have so much to do that she rose at 4:30 a.m. just to fit it all in. She would see her husband off to his early-morning landscaping job, then get her two sons up and ready for school before heading out to her own job. After cleaning two or three houses, she would fix dinner, help the boys with their homework, take them to baseball practice and point them toward the shower before bed. But in the year since she sought sanctuary inside Southside Presbyterian Church to avoid deportation, life has slowed to a crawl. To pass the time, she cleans the church’s shared shower room and helps volunteers prepare meals for the homeless. Sometimes she stays up until 4 a.m. — about when she used to get up — surfing the Internet. And why not? With her family still living in their South Tucson manufactured home to keep a sense of routine in her children’s lives, she has no reason to get up early. When she stepped inside the church 367 days ago, she knew it could take weeks, even months, for Immigration and Customs Enforcement to cancel the Aug. 8, 2014, deportation order that started with a traffic stop for an incorrect lane change, got worse with a petition to stay that the federal government never answered, and ended with a lawyer who didn’t ask that her case be closed. That put her on a path to being kicked out of the country. So far, ICE has denied her new attorney’s requests, but insists she is not a priority for deportation. That’s not enough for Robles Loreto, who has lived in Tucson since 1999 and wants a piece of paper saying she can legally stay — even if only temporarily. Once she’s deported back to Mexico, she can’t legally return unless something in the law or her situation changes, so she says doing it this way is her only chance. Still, had she known how long this would take, she says, she might not have done it. She has spent Thanksgiving, Christmas, her 42nd birthday and her sons’ birthdays inside the church. For the second year, she missed taking them to their first day of school. For their sake, her situation makes her sad. And for their sake, she says, she will not give up.